It’s not what you may think: this 41% is made up not only of people living at or below the poverty line. They are also dual-income earners with nice homes, nice cars, nice toys, a 401K retirement savings plan, big mortgages. and big credit card bills. But if they ever get into a bind and need some quick cash – say, because of a car breakdown or an unexpected doctor visit – they don’t have it. While this group may be rich in home equity and other investments, their assets are not liquid. In other words, none of those items converts easily into cash in an emergency. People in this situation even have their own name – the "liquid asset poor" – a term coined by the Washington, D.C.-based advocacy group Corporation for Enterprise Development. With no cash reserves, they are just one paycheck away from financial ruin should an emergency or a job loss happen because they cannot easily access cash on a moment’s notice. Sadly, the CreditDonkey.com survey also found that more than half of respondents (54%) said they may be stuck in this situation for the foreseeable future. They have not set up an emergency cash savings strategy. 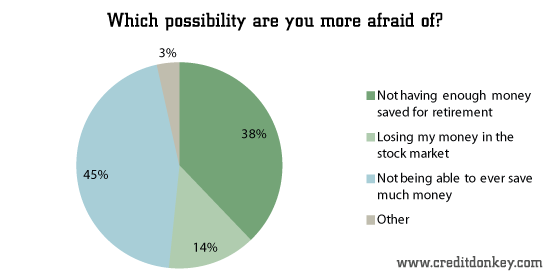 Interestingly, while these same respondents do not use a budget or an automatic savings plan (such as designating a specific portion of their income every paycheck to help them manage and save their money), almost half (45%) admitted they are most concerned about not being able to ever save much money. Many families may be put off by the concept of having enough cash savings to cover 3-6 months worth of earnings in case of an emergency, such as a job loss or medical condition. But the truth is many families can tighten their belt and begin to save at least some cash for smaller emergencies. That way, they can cover unforeseen expenses that just “pop up,” like a car or household appliance breakdown. It’s better to use cash for such emergencies, to keep debt at bay rather than make an unplanned strain on credit resources. This article simply screams the necessity of teaching financial literacy in elementary and high schools. It is a failure of our educational system that in one of the richest nations on earth that 41% of us have no more than $500 saved for emergencies. 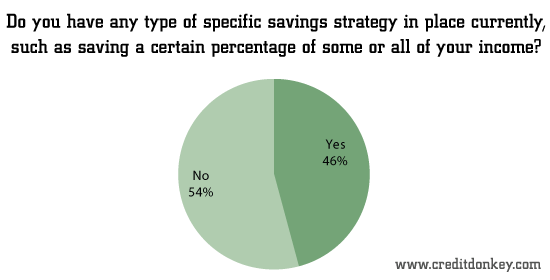 Share on Facebook "Survey: Savings Statistics"